What are some of the things you countdown the days for? Your wedding? Christmas? How about the Tour de France? There are many people that love the excitement that builds with the biggest cycling race of the year, and one of those many people is JGRMX mechanic Ben Schiermeyer who is in charge of keeping Pro Motocross front-runner Justin Barcia’s Yamaha YZ450F running in top condition. Even with the grueling motocross schedule, Ben finds time to watch nearly every stage, whether streaming the race on the app while working in the shop, or getting up early to watch. With just a few days left in the 2016 Tour de France, check out some reasons why Ben likes to watch this international sporting event. Watching the coverage, and hearing from former Tour de France cyclists, it’s intense how every detail is monitored. One of the broadcasts mentioned that Team Sky bought a separate van that is outfitted with a washing machine for each rider so they don’t have any germs crossover from one person to another. Team Sky is probably the most well-known for being extravagant when it comes to accommodations for the riders, but something must be working with their win-record as high as it is. I like to go for long rides, but seeing the maps and the miles these guys put in each day is really amazing. I mean there were back-to-back days of over 200 kilometers (over 125 miles). Whether it’s a day for the sprinters going after the green jersey, or a day full of climbing for the polka dot jersey, there is a challenge for every team to put their best rider at the front. (Quick note: Yellow Jersey = Overall Leader, Polka Dot = King of the Mountain Leader, Green Jersey = Sprinter Leader, White Jersey = Best Finisher up to 25 years old) I’ve come to realize that the team strategy each day is decided based on every small detail whether it’s the estimated wind speed or varying temperature. The aerial coverage or even with the motorcycle camera angles, it’s so hard to tell how truly fast they are going. It’s amazing there really hasn’t been more crashes in the final kilometers. I will say that when there are crashes, it’s pretty intense. Like this crash with some of the front runners and a motorcycle camera crew. Last year when we went to France for the Motocross of Nations, Justin and I went to the Arc de Triomphe in Paris, which is right where the Tour de France finishes. It was interesting to see part of the actual road they had to ride on, and believe me it wasn’t at all smoothly paved. Basically, I love the cycling and the watching the Tour de France only gets my competitive side going. 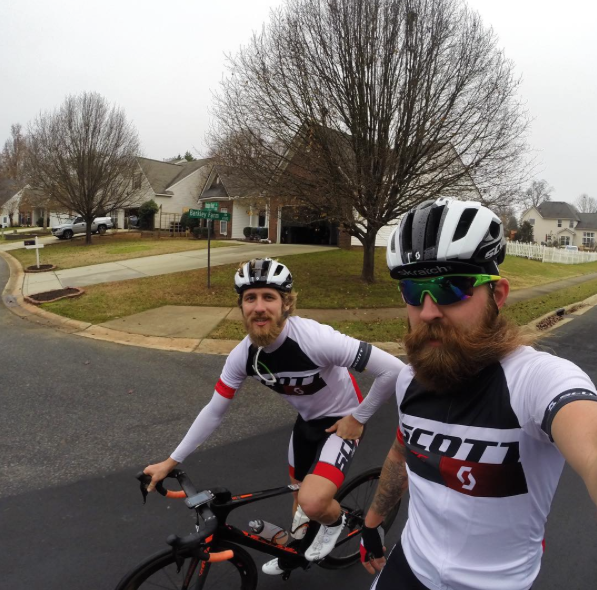 Thankfully Justin is just as competitive and we get in some pretty fast “lap times” when riding around Huntersville, NC. ...when Peter Sagan and Chris Froome teamed up in the breakaway and went for the win. I have a lot respect for those two racers who aren’t afraid to go for it when the opportunity presents itself. And they said it themselves that a move like that couldn’t have been planned. You don’t see the yellow jersey make moves like that too often so it was really cool to see. Thanks to Ben for sharing his thoughts on this year’s Tour de France. The final two days take place this weekend, with the final and 21st stage bringing the riders into Paris. To help you train like a pro, check out Rokform’s Pro Series Bike Mount that attaches straight to your fork. You’ll be moving up the standings in no time!